Isabel Wolff’s latest novel, Ghostwritten, is a poignant story about a Dutch girl and her family struggling to survive in a Japanese internment camp on Java. Isabel tells WWWB what drew her to this neglected part of World War 2 history. I’ve always had a fascination for the Pacific War. It began at 8, when I learned that my parents’ friend, Dennis, had been a POW in Burma. My mother told me, in hushed tones, that Denis had ‘suffered terribly’ and seen ‘terrible things’ although she didn’t want to say what those things might have been. When I was 12, I read A Town Like Alice, set in occupied Malaya, a novel that has stayed with me all my life. And a few years later I watched, avidly, the TV drama series, Tenko, about a group of British and Australian women struggling to survive in a Japanese prison camp. These things came together in my mind and I decided to write a novel about the internment of women and children in the Far East. There were many locations in which Ghostwritten could have been set: civilian men, women and children were interned right across the region in Singapore, Borneo, Malaya, the Philippines, China and Hong Kong. I chose to set it in the Dutch East Indies, on Java, where the Japanese camps were the most numerous. They were also, by and large, the worst. As I planned the story I read history books about the period and scholarly articles; I visited survivors’ websites and read their accounts. I interviewed two elderly women who as children had been interned on Java and still vividly remembered the daily privation, brutality and fear. I went to Java and saw the places in Jakarta (formerly Batavia) and Bandung where thousands of women had been interned. And as I stood in the Dutch War Cemetery and gazed at the white crosses for women and children that stretched away from me in all directions I was saddened to think how little their suffering is known. For the truth is that the male/military/POW narrative has come to define the story of the War in the East. I wondered why this should be. Perhaps it’s because the Thai Burma ‘Death Railway’ was so ‘epic’ and monstrous, and has been dramatized with vivid horror in films such as Bridge on the River Kwai. More likely it’s because the soldiers had their army, their regiments and their comrades to extol their courage, and to make sure that their story was known. Yet the same number of civilians – 130,000, mostly women and children – were also imprisoned by the Japanese. These were Dutch planters, missionaries, civil servants and teachers who after the fall of Java were herded into hundreds of concentration camps. Like the POWs, the civilian prisoners suffered starvation, forced labour, cruelty and death. Yet they have had no-one to speak up for them. This became apparent to me this spring, when Ghostwritten was published. One of the most common responses from readers was: ‘I had never heard about this.’ Perhaps this wasn’t so surprising, I reflected, given that you now have to be over 45 to remember Tenko. There was the film, Paradise Road, about a group of American and Dutch women in a camp on Sumatra, but that was back in 1997. Since then no films or novels have focussed on the civilian story, ‘though writers and directors continue to be fascinated by the suffering of the military men. This year alone there have been two Hollywood films – The Railway Man and the soon-to-be-released Unbroken about the Olympic runner and Japanese camp survivor, Louis Zamperini. Dutch friends tell me that in Holland this part of wartime history is not widely taught, compared to the Nazi occupation of the Netherlands, and the Holocaust. In their memoirs the internees who were repatriated to Holland in 1946 tell of further alienation in which, far from being welcomed back to the mother country, they were bitterly resented. 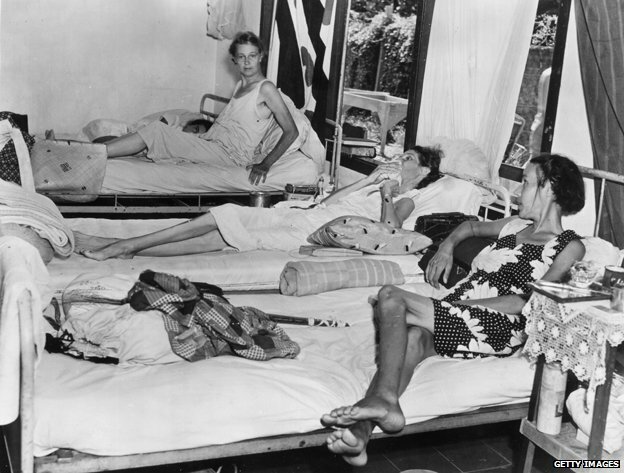 Because they were emaciated – most had lost 30% of their body weight – they were given extra food coupons. In grocery shops they would get sharp looks and sharp remarks. ‘Why should we look after you?’ was a frequent cry. ‘While you were sunning yourselves in the tropics, we had the Nazis!’ After all, the Dutch had themselves been starved during the terrible ‘Hunger Winter’ when the Germans blockaded northern Holland for six months. Little wonder then that there was no compassion for these ‘pampered colonials’ who were widely referred to as ‘Uitzuigers’ or ‘leeches’. It was as though there had been two, quite different wars, and the repatriates soon learned not to talk about theirs. Their war was the war of starvation, dysentery, savage beatings and bamboo fencing. In time, survivors began to tell their story in memoirs, all with titles redolent of a lost Eden: Dark Skies Over Paradise; Java Lost and Stolen Childhood. And now there’s a novel, Ghostwritten, which has their ordeal, and their courage, at its heart.